LAWS #44 Cookies and/or Dia de los Muertos showcased some LAWSter favorites and some new LAWSter faces! and sounds! The Active Ingredient brought both dance and shoe-gaze to salon table! Before I forget, I have GREAT NEWS! 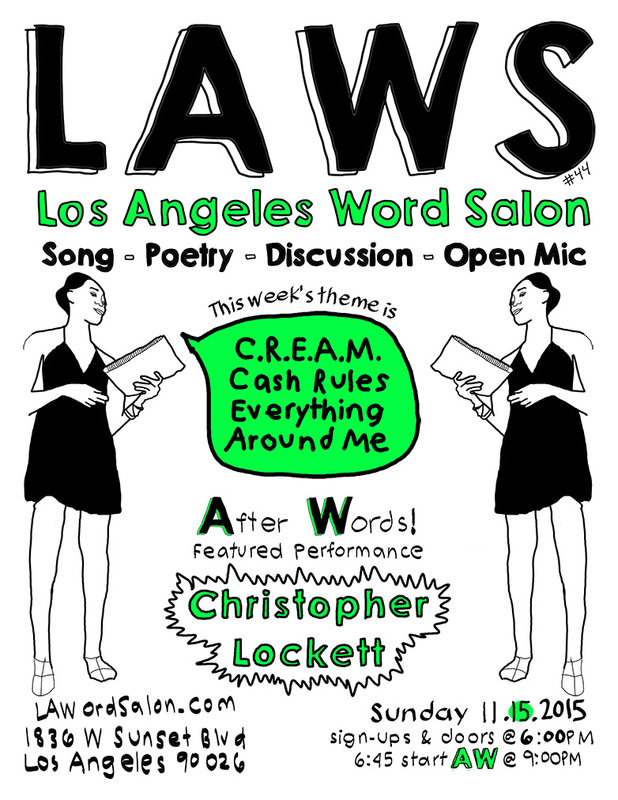 LAWS is now the 1st and 3rd Sunday of the month in Echo Park! More time to muse, procrastinate, and create! I want to officially invite you to next week’s LAWS #44 C.R.E.A.M. Cash Rules Everything Around Me! Check it out! Join the event! It’s on Sunday, November 15th! See the full LAWordSalon from Cookies and/or Dia de los Muertos here ! See you for LAWS2 on the third Sunday of the month, November 15!